Scientists in the US have discovered a terrifying land-living crocodile, which lived in what is now North Carolina 230 million years ago. 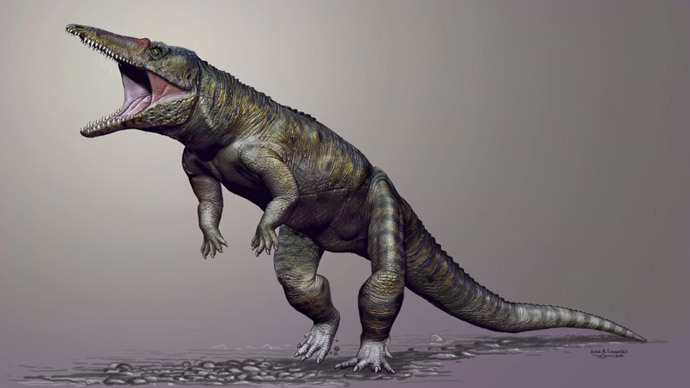 The crocodile, called Carnufex carolinensis, which literally means the Carolina butcher, was a very early member of the crocodile family, but unlike its modern ancestors it was not aquatic, nor a quadruped but prowled around on two legs. It was about 3 meters long and about 1.5 meter tall and had blade-like teeth and a long skull. Carnufex lived in the warm equatorial region in what is now North Carolina alongside such animals as aetosaurs - armor plated plant eating reptiles - as well as early mammals and four-legged phytosaurs, which lived in water and had long snouts and looked a bit like today’s crocodiles. Carnufex were the large predators of their time and lived just before the appearance of the first dinosaurs in the Triassic period. “As one of the earliest and oldest crocodylomorphs, Carnufex was a far cry from living crocodiles. It was an agile, terrestrial predator that hunted on land, Carnufex predates the group that living crocodiles belong to,” said Lindsay Zanno, a paleontologist at North Carolina State University, who led the research into the beast. The absence of predatory dinosaurs at the time may have allowed Carnufex to grow to its giant size. Zanno and her colleagues discovered parts of the skull, spine and arm of the crocodile while digging in the Pekin Formation in Chatham County, North Carolina and published their findings in the journal Scientific Research. But Carnufex’s role as top dog of the food chain did not last, the extinction at the end of the Triassic period killed it off although the smaller crocodylomorphs and theropods were left untouched. Crocodylomorphs, the ancestors of modern crocs, evolved to fill the role that foxes and jackals have today. “As theropod dinosaurs started to make it big, the ancestors of modern crocs initially took on a role similar to foxes or jackals, with small, sleek bodies and long limbs. If you want to picture these animals, just think of a modern-day fox, but with alligator skin instead of fur,” Susan Drymala co-author of the study and graduate student at North Caroline State University, said in the statement.